For several days now the painting was on fire. Not a literal one – no flames or smoke wafting into the air, no one scurrying to find a fire extinguisher. Rather it was a slow, barely perceptible simmering under the surface as unsaturated fatty acids reacted with oxygen in a process frequently described as a form of ‘flameless combustion’ or, in more technical terms, ‘autoxidation’. As this oxygen was being absorbed, highly reactive free radicals were being spun off, along with unstable hydroperoxides that quickly decomposed into an array of often-volatile components. Slowly, out of this process, crosslinks were formed between the polymer chains, binding them together into an increasingly dense network of long entangled strands. As a result, the oil that once flowed between the pigments would initially thicken, then gel, and ultimately feel dry to the touch. However, because it absorbed such a large amount of oxygen along the way, the oil also grew in volume before the volatile by-products that were slowly being released helped to settle things down and find some form of apparent equilibrium. Eventually the fire would die down, the slow oxidization would give way to even slower processes that would continue morphing and changing for centuries to come, and the film, initially so pliable, would become increasingly stiff and brittle over time. While the details of this process have been covered in numerous publications, for our purposes it is enough to realize that oil paint never actually ‘dries’ through evaporation, but rather oxidizes and undergoes a series of chemical reactions to form a solid film. One way to follow this process is by simply weighing a sample of oil paint over a period of time in order to gauge the amount of oxygen it has absorbed. (Sabin, 1910; Tumosa, Mecklenburg, 2003) The more oxygen, the more crosslinking. In the pages that follow we share some of our initial results from longer-term testing initiated over the last year. As we will see, the resulting weight gains can be quite substantial, with linseed oil growing by some 15- 20% in mass before gradually declining to more modest levels. By examining the data in some detail, we can develop a much better understanding of how various factors impact the overall drying rate. However, before embarking on that path, it is valuable to touch on some of the more basic components involved, including the type of graphs that are generated. The handful of plant oils that will form a film if exposed to oxygen usually have higher percentages of three unsaturated fatty acids in particular: oleic, linoleic and linolenic. How unsaturated each of those are is determined by the number of reactive sites, known as double bonds, which are available for crosslinking. Oleic is the least reactive, with just one double bond, while linoleic and linolenic have two and three sites respectively. The more sites, the more reactive, and ultimately the more durable, faster drying, and crosslinked the film will be. 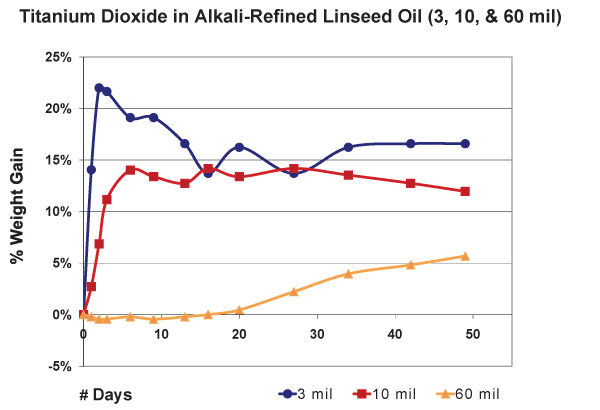 Historically linseed, walnut, and poppy have all been used at one time or another, although linseed has clearly been the most prevalent of the three and, with the highest level of linolenic acid, produces the strongest and fastest drying film as well. More recently safflower has gained in usage, where its very light tone and resistance to yellowing makes it particularly popular for use in whites. Those qualities come at a cost, however, since it has no linolenic acid to speak of, so produces a more fragile and slower drying film. Beyond these basic differences, there can also be differences in how the oils are processed. 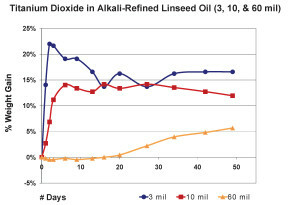 Probably the three most commonly encountered are Alkali-Refined Linseed, Cold Pressed Linseed and Stand Oil. Alkali-Refined is extracted using heat and solvent, and then further processed with alkaline chemicals to remove impurities. Cold Pressed, as the name implies, is extracted through pressure alone and impurities are removed through mechanical filtering and cold processing methods. Stand Oil is more accurately described as heat-polymerized or heat-bodied, and is made by subjecting linseed oil to very high temperatures (~300 C / ~570 F) in the absence of oxygen. This allows it to polymerize without ever undergoing oxidization and imparts a viscous, self-leveling quality that is one of its hallmarks. Because Stand Oil also has far fewer reactive sites still available, it dries slower than regular linseed and is quite resistant to yellowing over time. While substrates were not the main focus of our study, and we stuck primarily to inert sheets of polyester film and lacquered cards, they can certainly play a role in the drying process. Absorbent surfaces and primers can pull oil down into themselves, leaving the paint leaner and faster drying, while metal ions found in metallic substrates or lead grounds can migrate into overlying paint films and act as a catalyst for accelerating oxidization. And for thinner, more translucent films, even the color of the surface could make a difference as the amount of light absorbed or scattered back through an oil paint film might impact drying times in a measurable way. If nothing else, this is certainly an overlooked variable we hope to include in future testing. In oil paints driers are typically composed of heavy metallic salts that act as catalysts in the drying process, speeding up or optimizing many of the underlying chemical reactions. Some, like cobalt, are known primarily as surface driers because they promote oxidization at the paint/air interface, while others like manganese are more intermediate, helping with oxidization at the surface while also serving as a ‘through’ drier that aids with overall polymerization. Supplementary driers, such as zirconium and calcium, are sometimes used in conjunction with one of the above to help improve overall performance, but by themselves appear to have little or no effect. For many artists it can be tempting to use driers liberally as a way to speed-up the normally slow curing process, but their over-use can cause increased brittleness as well as surface defects like wrinkling. To investigate the process of drying in oil paint films we initially focused on a single pigment, rutile titanium dioxide, in a range of formulations from very basic combinations of one or two ingredients, to variations on more complex recipes. 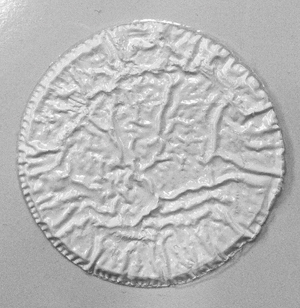 The test samples were cast on clear polyester films as 3 and 10 mil drawdowns, as well as 2″ diameter, 60 mil disks. As a point of reference, a typical piece of standard copier paper is 3.8 mils thick, while 62 mils is approximately 1/16″. Weights were recorded daily for the first week, then 5 days a week for the first month, and then weekly for the remainder of the period. Temperature and humidity were not controlled but stayed within ambient conditions of 40-55% RH and 70-75°F. 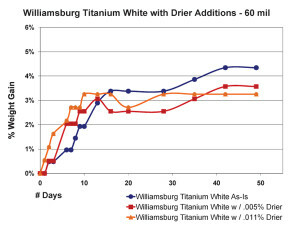 One set of samples combined the titanium dioxide with different oils, including safflower, alkali-refined linseed, cold pressed linseed, and a lower viscosity stand oil. A second series was made from alkali-refined linseed oil and titanium dioxide in combination with one of the following: blanc fixe, calcium carbonate, precipitated calcium carbonate, beeswax, and zinc oxide. 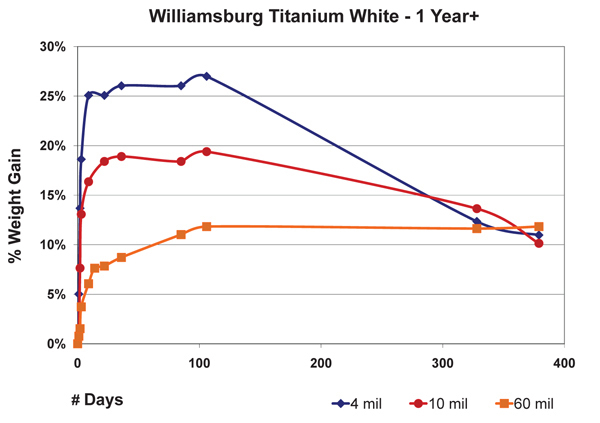 A third group was based on our own Williamsburg Titanium White, which we make with no added driers, and comparing its performance to batches where two differing levels of cobalt-manganese driers were mixed in. 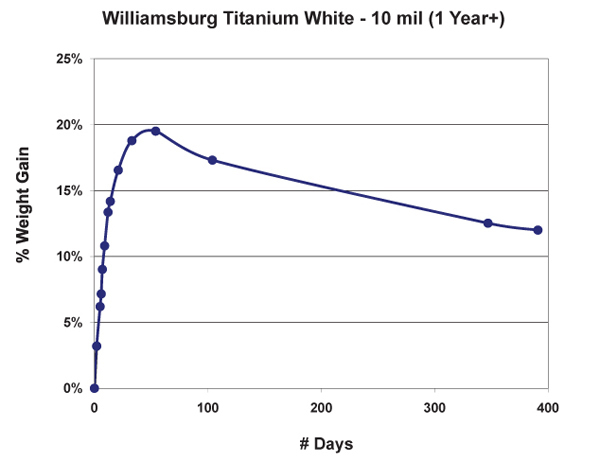 We also share results from a very early weight study we carried out based on samples cast over a year ago at thicknesses of 4, 10, and 60 mils. What follows are simply selected highlights of the broader testing outlined above, which will continue for years if not decades to come. In order to better understand the data, it can be useful to start with a couple of very basic graphs. 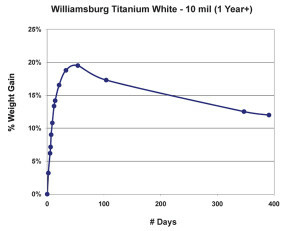 The first (Figure 1) shows the percentage of weight gained over a number of days by just the oil contained within a 10 mil film of titanium dioxide ground in alkali-refined linseed. In order to generate this data, we had to subtract out the constant weight of the pigment and the substrate from the constantly changing weight of the overall sample. As one can see, the most dramatic change happens in the first few days, when the oil gains almost 16% in weight. As it approaches this mark the paint begins to skin over and will feel touch-dry when it finally achieves its highest level during the 4-6 day period. This correlation between changes in weight and actual stages of drying has been recorded by other researchers as well, and can allow one to roughly calculate when an oil paint will feel touch-dry by simply noting when it reaches its maximum weight. As it turns out, that moment also corresponds with the largest degree of oxygen uptake, and therefore the highest amount of cross-linking activity. One would have a very false sense of the overall dynamics, however, if you only looked at data drawn from such a brief period. For as stable as the paint might appear as it coasts along comfortably for the first couple of months, settling into a seemingly constant 13% level, when we track similar paint films over a much longer period of a year or more, the story is quite different. As we can see in Figure 2, after the dramatic climb during the first few weeks, the weight appears to stabilize for a while slightly below the 20% mark, but then experiences a fairly steady decline as volatile by-products from ongoing chemical processes continue to escape. As Tumosa and Mecklenburg (Tumosa, Mecklenburg, 2003) have shown, as an oil paint film continues to age this decline will eventually level off to a large extent, but it really never completely ends and even after several centuries oil paint films continue to be fairly dynamic materials. The graph also helps inform the oft-repeated advice that even thin films of oils should be allowed to cure for 6-12 months before varnishing. Certainly before that point the paint film is still undergoing not only dimensional changes but chemical ones as well, both in terms of forming longer chainend polymers and off-gassing any volatile components created as a result. 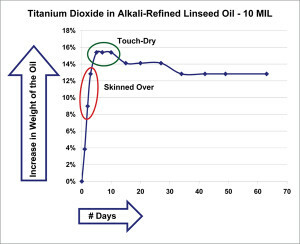 If we now expand this same process of tracking, we can look at a graph that shows the weight gain for various oils ground with titanium dioxide and notice some clear differences between them (Figure 3). 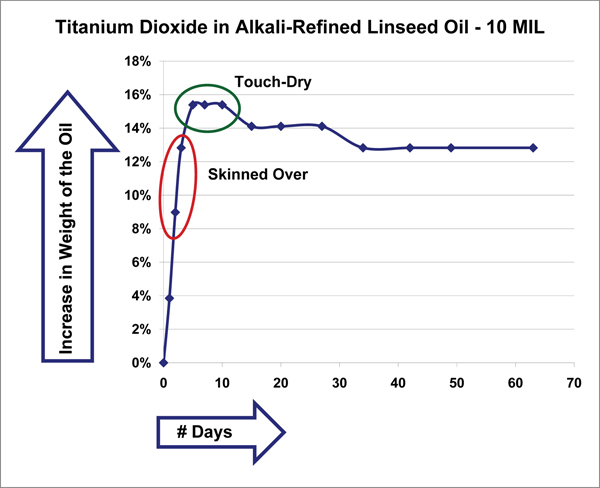 Initially both alkali-refined and cold pressed linseed oils, which are the most reactive, display a dramatic increase in weight during the first few days, peaking at 15-18%, before eventually leveling out. From a more tactile point of view, one would experience the paint as forming a heavier and heavier skin in the days leading up to those maximum levels, and then sense it becoming increasingly touch-dry as the line began to flatten out. Stand oil, by contrast, has very few reactive sites for absorbing oxygen and gained weight at an extremely slow pace, taking almost 50 days to reach its maximum level of ~8%. And while it did skin-over much earlier than that, and could even be described as touch dry by the end of the second week, the film remained very soft with a high degree of tack even after a full two-month period. 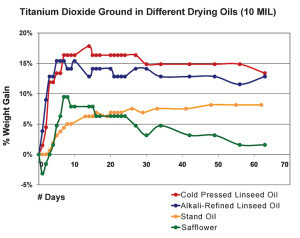 Lastly, samples made with safflower oil had their own unique trajectory, consistently showing a slight loss of weight in the initial period before climbing towards a maximum gain of ~9% after more than a week. After that, the oil showed a steady loss, falling back to just over 1.5% by the end of a two month period. This dramatic decline is similar to the one recorded in a study (Tumosa, Mecklenburg 2003) where a continuous drop in weight was followed for more than 2 years and resulted in the film even weighing less than it did at the start. This unusual pattern is attributed to the fact that safflower.s fatty acid profile is heavily weighted towards the less reactive linoleic acid, while containing essentially none of the linolenic prevalent in linseed. And this presents a double-edge sword whenever considering the use of safflower oil in artists. paints. 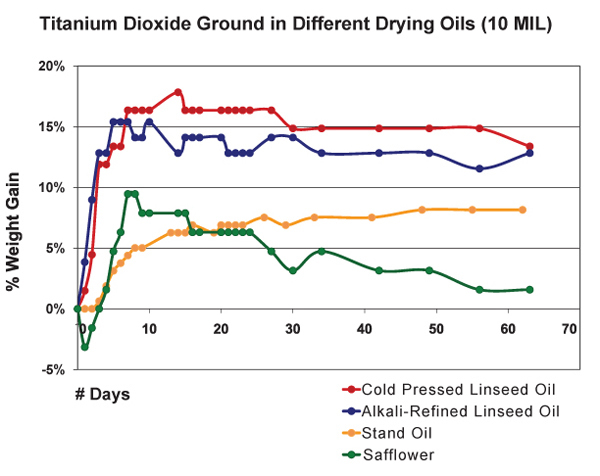 On the one hand, by being less reactive, safflower oil is less prone to yellowing because a lower level of oxidization produces fewer of the by-products believed to be at the center of those color changes. However, with fewer double bonds available for crosslinking, safflower oil produces a more fragile film that is also more permeable, allowing for a greater loss of volatile products and hence a greater loss of weight as well. All of which makes the use of safflower oil in underlying layers potentially problematic and something for the artist to take into account. So far we have focused exclusively on 10 mil films, but other thicknesses can produce very different results. In the next graph we show the average percentage of weight gained by multiple samples cast at three different thicknesses. As before, we have subtracted the weight of the pigment and substrate in order to study the changes in the weight of the linseed oil itself (Figure 4). convergence, but at least one possibility does suggest itself. To start with, it.s important to realize that the observed weight at any particular moment is really the combined measure of both the oxygen that has been absorbed minus the loss of any volatile by-products that have been generated. So the fact that films, as they get thicker, do not reach as high a percentage of weight gain as very thin ones might simply mean their ratio of oxygen in and volatiles out is more balanced. In this regard the driving force might simply be an issue of surface area. Oxygen can clearly permeate a thin film more easily, thus allowing a very large percentage of the paint to undergo oxidation all at once and only then to start the process of gradually losing mass. Conversely, as a film gets thicker, an increasingly smaller percentage of its material can undergo these processes at any one time. Rather than the meteoric rise seen in the thinner films, a much gentler slope would describe the percentages of weight gained. Which of course is what we see reflected in the charts. The fact remains, however, that oil paints applied in significant layers still present some very real difficulties in terms of drying. Both oxygen and light, for example, can have an increasingly hard time permeating the entire volume of paint because the pigments and any other solids simply block their way. In addition, thicker applications will form an initial skin on the surface, which then acts as a diffusion barrier, and further limits the free flow of oxygen . especially as this skin becomes more and more substantial. Taken together, these factors can result in a core of still-wet paint being present years or even decades after it was applied. It is also why these types of applications are very prone to wrinkling, since this initial skin usually forms while the paint is still gaining weight and at maximum volume, and before shrinking from the loss of volatiles later on. We can easily see examples of these issues by looking at a 60 mil sample as well as a line of paint squeezed directly from a tube and left to dry for more than a year (Figures 6, 7). One of the final issues we explored was the impact of different levels of drier when added to a paint formulation. For our purposes we primarily focused on a cobalt-manganese blend because this combination remains the most common and readily available for the artist to use. However, these metals are considered primarily surface driers and other combinations that might improve through-drying, such as the addition of zirconium and calcium, would have likely given different results. The most significant finding in this area was the very counter-intuitive observation that increasing the amount of drier above a certain level did not increase the drying rate, as one might expect, but in fact, clearly slowed it down. This actually agrees with similar results of research that looked at the impact of driers on linseed oil alone (Mallol, et al., 2000). As one can see in Figure 8, which shows the results for 10 mil films, the paint containing a small amount of drier (.005%) actually did gain more weight more rapidly, suggesting a more complete level of oxidation in a compressed amount of time. 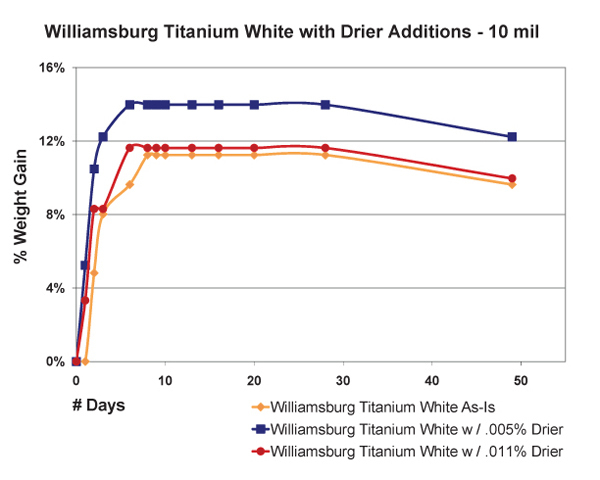 However, when the percentage of drier was more than doubled to .011%, the sample ended up doing no better than our standard Williamsburg Titanium White, which contains no drier whatsoever. Thicker films showed a slightly different pattern but essentially demonstrate the same concept (Figure 9). Unlike before, the paint with the most drier this time did appear to get out to a faster start, breaking past the 3% level of weight-gain a few days early. However, this boost was short lived and its rate of increase quickly leveled out and even fell beneath the sample containing less than half that amount of drier. 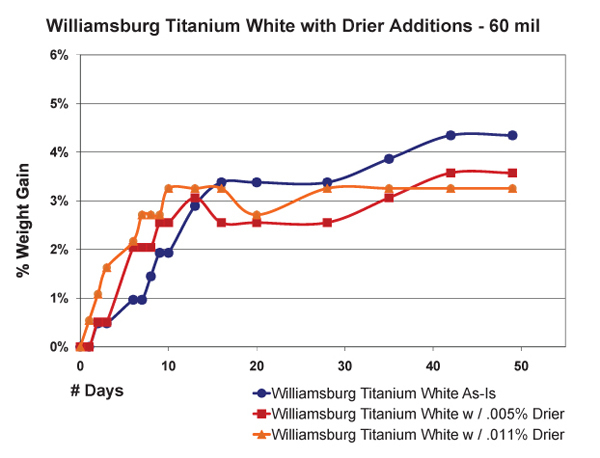 Perhaps what is most surprising, though, is the fact that the regular Williamsburg Titanium White – which again has no driers of any kind – ultimately ended up with the highest overall increase in weight among the three. What is happening in these two examples? And how can adding driers actually slow down the rate of weight-gain, and by implication, the degree of cross-linking as well? The answer resides in a couple of areas. First, because these driers are more active at the surface, they often cause a paint to skin over much more quickly, which in turn creates that diffusion barrier we mentioned earlier. In this way an innocent attempt to boost drying times can actually end up slowing down the overall process, and in some cases even hindering the paints from curing completely. Like the example shown in Figure 7, where the center of a bead of paint remained wet even after a year, driers are simply causing an outer skin to form much earlier in the process, which increases the risk of wrinkling and can cause any underlying paints to remain soft and mobile. Secondly, the effectiveness of cobalt drier appears to be fairly short-lived once it is exposed to oxidation. In fact, the researchers that conducted the study (Mallol, et al, 2000) estimate that it starts to significantly decrease in strength after just 7 or 8 hours due to the generation of specific by-products that suppress their reactivity. This could also explain why the rates of increase for thicker films appear to wane well before a substantial skin is ever formed. This has only been a cursory sampling from some of our current, ongoing testing. Inevitably these trials will create more questions than they can possibly hope to answer, and in the process will open many new avenues of exploration for decades to come. The hope is to ultimately bridge the gap that can sometimes exist between conservation research, with its emphasis on analyzing and understanding the past, and the need for practical answers that can help current artists make informed choices about their materials and create the basis for best practices. For further updates from this research, please visit goldenpaints.com and williamsburgoils.com. The following chart shows the relative drying rates of Williamsburg Handmade Oil Colors. Your actual dry times will be affected by how thickly the paint is applied, the absorbency of the surface, and even the surrounding colors. Precisely which drier formula was used? Thank you. Hi Charles. 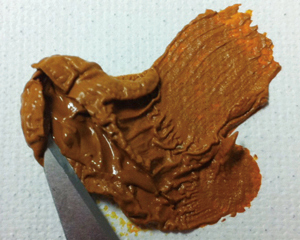 The drier was a standard manganese cobalt mix that is commonly used to adjust oil paints. Most painters will usually find it pre-diluted with solvent to allow for easier use but we used a solventless concentration. Thank you so much. The problem is, I can’t find any information on the actual concentrations in these diluted driers! Cobalt Tillate and D-Limonene, for example, is pre-diluted, but to what?? And the instructions say “..[use] small amounts.” and “test before using,” etc. I just so happened to have a Grumbacher drier, and it’s rather an emergency (show). What’s the dilution, 10%, 1%, .01%? I spent hours looking online; It should be everywhere. I want to know how many molecules I’m using! So I made a 1% solution just to be safe, and used what amounted to a .005% solution based on reading your article, but for all I know, it was a .00005% solution. I haven’t a clue, and I can’t find the information. Where am I supposed to look? I’d be willing to go out of my way to buy a Wiliamsburg drier if I knew what was in it, but what otherwise would be the point? Your article is fantastic reading, despite the the redaction which I understand might be required proprietary secrecy. But please try to share more, if you can. Thank you so much! Hi Sara, I’ve just discovered this informative and precise article, I hope it’s not too late to ask a question. My attention was caught by the sentence: “highly reactive free radicals were being spun off, along with unstable hydroperoxides that quickly decomposed into an array of often-volatile components”. Free radicals are usually regarded as very unhealthy, at least when ingested. Are they equally dangerous when inhaled? Is the mere smell of an oil painting somewhat harmful? When I paint in oil I avoid solvents, which implies that I use some more oil, so I’m interested in this subject. Hi Mario – Sorry it took me a while to see this and respond. The free radicals being spoken about in the article are limited to the chemical reactions happening within the process of oxidization and do not represent anything to be worried about. Free radicals tend to be very short-lived and are associated with a wide variety of common and essential processes. For example, many forms of combustion such as the common one of fire involve free radicals as part of their process. So, while we continue to advocate for reducing solvent use and exposure, to improve health and safety, the chemical processes involved with the curing of oil paint is not an area of concern. Thank you for your answer, Sarah (and sorry for misspelling your name in my former comment). Looking forward to your articles here on JustPaint. You briefly mention that you also did tests with blanc fixe and calcium carbonate, how did those turn out? We are glad you enjoyed reading the article again within this new format, and yes, all of Just paint is now offered in this way. So please feel free to explore and rediscover all of the past articles, as well as subscribe so you can know when new ones are published. Currently we post two a month online, and will continue publishing a print version at least once a year. As for your questions, the inclusion of blanc or calcium carbonate did seem to introduce small differences but the testing was too limited to be conclusive and so additional testing will need to be done at some point to tease apart the data more. 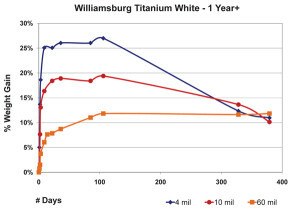 Especially useful would have been testing films of these materials alone, as compared to Titanium White, and also to look at how they might impact other pigments beyond just titanium white. So, while included in the initial testing, we placed that data off to the side for further exploration and focused more on just the differences in oil and the use of driers. Zinc Oxide is a similar story – some differences were seen but would need to focus more directly on zinc’s impact at different levels and in different systems before we could conclude anything. In terms of drying, in thin films id did not seem to have a large impact, but in very thick ones it did slow things down, which is not surprising or unexpected. Hope the above is helpful and as always, if you have any other questions, just ask! Leave a Reply to Tona Aspsusa Click here to cancel reply.